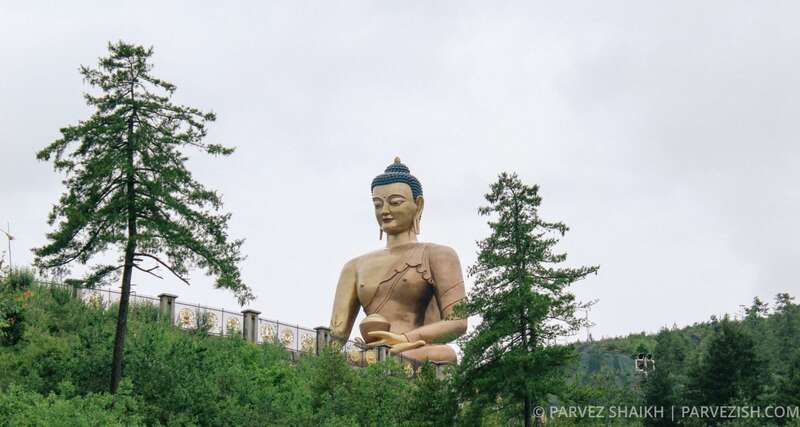 From temples to forts to museums to one of the world's largest statues of Lord Buddha - here are 6 interesting places you must visit in Thimphu - the capital of Bhutan. Bhutan is one of the most beautiful and interesting countries I have visited so far. This small Himalayan Kingdom has so much to offer in terms of scenery, nature, religion, culture, architecture, hospitality, and food that I would never get bored of visiting it again and again. Bhutan charges a tourism fee of $250 (or $200 offseason) per day. While it could be a costly affair for many tourists, this fee is worth it according to some travellers I met along the way. Citizens of India, Bangladesh, and the Maldives don’t have to pay this fee and can explore the country by themselves. Other nationals, however, are accompanied by tour operators who will prepare an itinerary for you. So, when you’re paying a hefty charge to explore this beautiful country, you have to get the best out of it. Bhutan has a rich history, interesting culture, and beautiful architecture to be experienced in every part. Thimphu, the country’s capital, has many interesting places, too. And I’m sure your tour operator will include these places in your itinerary. 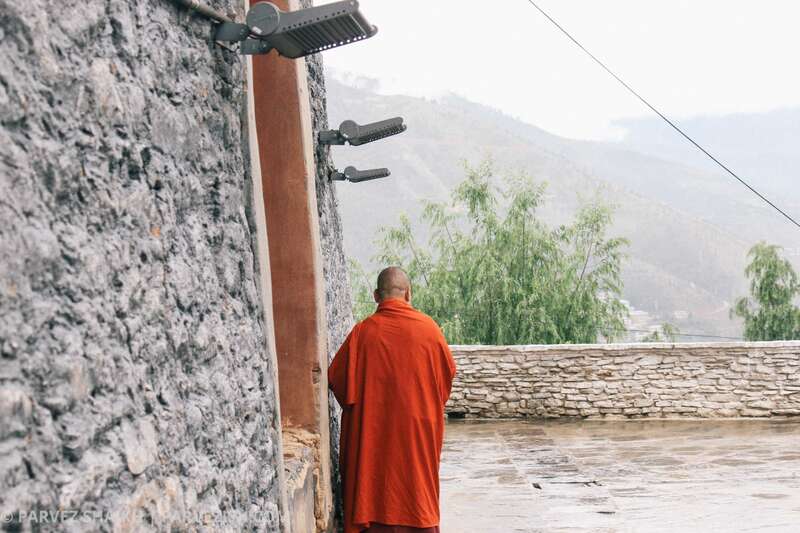 In this article, I will list some of my favourite places in Thimphu. Make sure your itinerary includes these places to get the most of your trip. You might also like to read my earlier article that shows 5 must-visit places in Paro. Now, religious places are not my thing. I usually avoid paying them a visit – not for religious purpose, at least. When I do visit a religious site, though, I do it to find some peace and inspiration. Memorial Chorten, also known as National Memorial Chorten, is one of those religious places I visited recently. This visit that lasted almost a whole day, taught me a few things that helped me changed the views I had about my life. I detailed this experience in my previous article and you might want to read it. So, why should you pay Memorial Chorten a visit? Well, it’s a beautiful place, to begin with. You will find some peace and might learn a few things about Buddhism there. You can enter the Chorten and see those interesting paintings. Your guide will tell you the history of the place as you go. Sit somewhere in silence and observe those lovely elders busy with their prayers. Oh, and take some photos, too. Built on a site chosen by Lama Phajo Drukgom Shigpo in the 12th century, Changangkha Lhakhang is one of the oldest temples in Bhutan. It’s a popular temple among locals as well as tourists and offers a beautiful view of Thimphu. As a popular tradition, local parents pay Changangkha Lhakhang a visit to approach the inner sanctum and ask protector deity Tamdrin to bless their children. Parents of newborns come here to request auspicious names for their babies from the four resident monks. As a visitor, you can take a tour around the temple, spin those beautiful prayer wheels, offer your prayer, observe locals as they engage in their regular activities, or just sit down on a bench in silence and enjoy the view. In years after the fort was built, it has seen a lot of changes to become what it looks like now. When Shabdrung Ngawang Namgyal took over the fort, he found it too small and built a new building known as the lower Dzong. The original Dzong was destroyed by fire in 1771. The building that remained was then damaged during an earthquake in 1897 and was rebuilt in 1902. Tashichho Dzong was renovated and expanded by King Jigme Dorji Wangchuck after Bhutan’s capital was moved to Thimphu in 1952. Thimphu Tshechu – one of Bhutan’s biggest festivals – takes place at Tashichho Dzong for three days in the 8th month of lunar calendar. Bhutan is all about Buddhism and you can’t help but notice that the religion has a strong influence on everything people do. They blend the religion and their culture in almost all aspects of their daily life. With the religion being such an important part of people’s life there, Bhutan had to have a place dedicated to Lord Buddha. Buddha Dordenma is exactly that place. 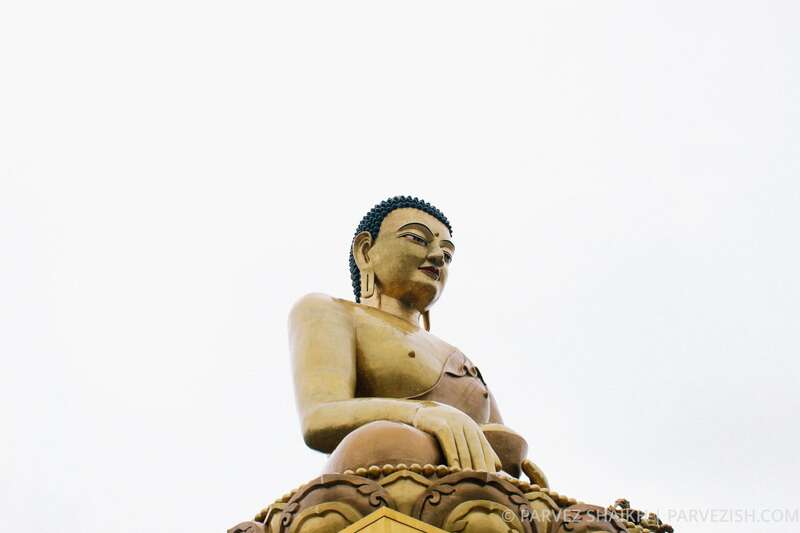 Located atop a hill in Kuenselphodrang Nature Park, Buddha Dordenma is basically a huge 51.5-metre statue of Shakyamuni aka Gautama Buddha overlooking the valley of Thimphu. It’s one of the largest statues of Buddha you can find in the world. The statue – which is made of bronze and gilded in gold – is accompanied by 1,25,000 small Buddha statues. Out of these 1,25,000 statues, 1,00,000 are 8 inch and 25,000 are 12 inch tall. Underneath the statue is a large meditation hall. You can take a taxi to reach Buddha Point and enjoy bird’s eyes view of the Thimphu valley. It’s a good place for photography, too. With all my efforts, I couldn’t spend more than 30 minutes here. You too should be okay spending similar time at Buddha Point. National Library of Bhutan was established in 1967 with a small collection of precious texts. It was built under the patronage of Queen Ashi Phuntso Choden for the purpose of ‘preservation and promotion of the rich cultural and religious heritage’ of Bhutan. With the collection of sacred text growing, the library was moved to the present, a much bigger four-storeyed building in 1984. 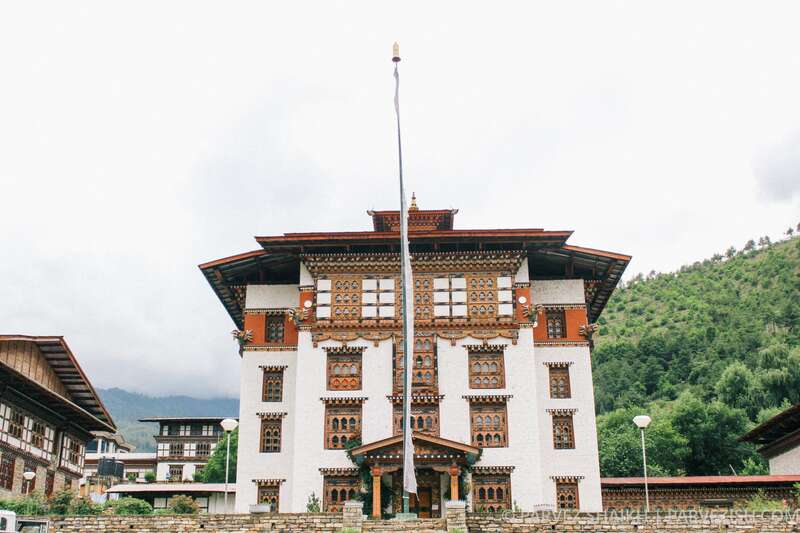 It currently houses rare books, manuscripts, photographs, and microfilms important to Bhutan’s heritage. Also present here is the gigantic book – ‘Bhutan: A Visual Odyssey Across the Last Himalayan Kingdom’ by Michael Hawley. Measuring 1.5 m × 2.1 m (4.9 ft × 6.9 ft) and weighing 133 pounds (60.30 kg), this book used to be the world’s largest book until 2007. If you are interested in history and sacred text, National Library & Archives of Bhutan is your place to be. The collection of books is not as huge as some claim it to be, but it’s surely worth a visit. Discover Bhutan as it used to be in olden days at Simply Bhutan. Simply Bhutan is a living museum depicting Bhutan’s ancient cultural heritage and the ways Bhutanese people used to live in olden days. Simply Bhutan was inaugurated by the Queen Mother Tshering Pem Wangchuck in 2012. Since then, it has come to become one of the popular attractions of Thimphu. When you enter Simply Bhutan, you will be accompanied by a guide who will welcome you with some local rice wine. You will be taken on a tour around the museum and your guide will explain things one after another. At the end of the tour, you will be presented with butter tea. This short tour to learn about ancient Bhutan will cost you $3 (150 Ngultrum). You can also try local dresses Kira or Gho for an extra dollar. The Himalayan Kingdom of Bhutan blends religion, culture, traditions, hospitality, architecture, nature, and food very well. No wonder a traveller like me would love to visit this small country again and again. 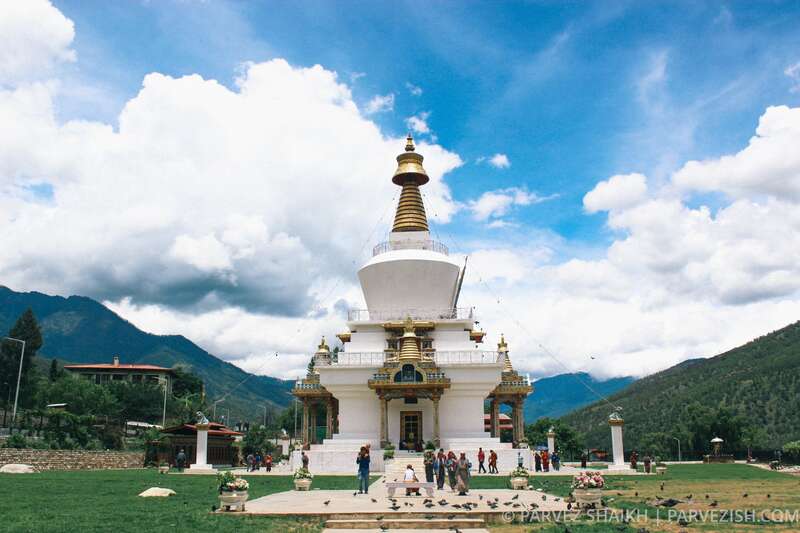 There are many places in Thimphu – the capital of Bhutan that you would love to visit. My favourite places in Thimphu includes Memorial Chorten, Changangkha Lhakhang, Buddha Point, Thimphu Dzong, the National Library, and Simply Bhutan living museum. The itinerary prepared by your tour operator might include all of the places mentioned in this list. But if doesn’t or if you’re exploring the country on your own, you should make sure to visit at least these six places to get the most of your trip. Have you already visited Bhutan? Which are your favourite places? Do share with me. That’s all, folks! 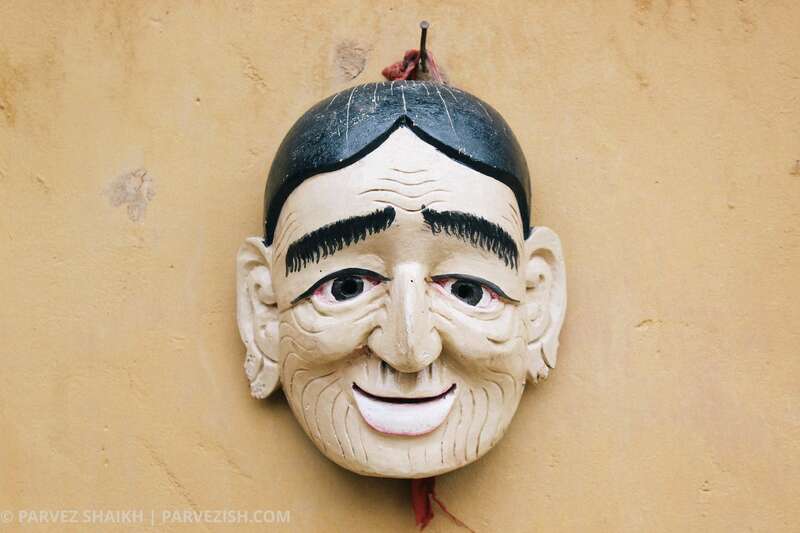 You were reading 6 Interesting Places You Must Visit in Thimphu on Parvezish.com. I hope you found this article worth your time and I’d like to thank you for reading. Did you like this article? Please share it with others. Could it be improved? Do let me know.